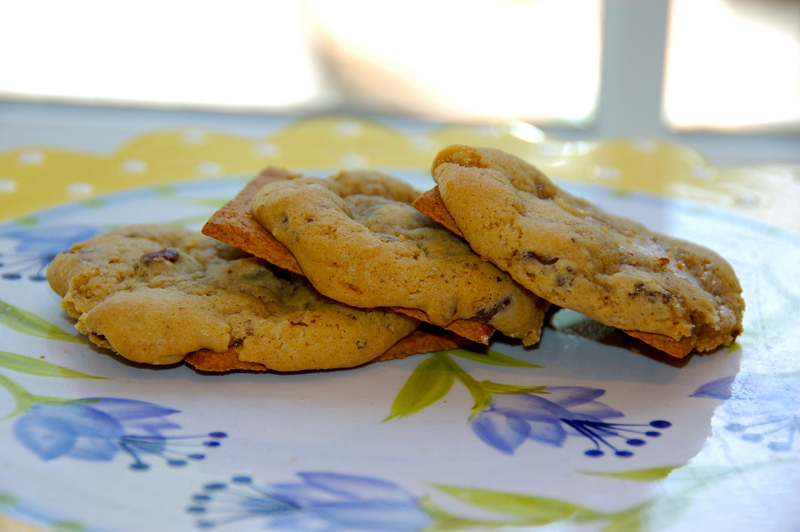 Ever since I first made these cookies, they have been by far the MOST POPULAR sweet of mine. My friends and family adore them – they’re a perfect, unexpected blend of a soft chocolate chip cookie with an entire campfire s’more – graham cracker and all! Added bonus: they don’t require any chilling, so they’re done in just under a half an hour! The most fun part of baking up these babies is the graham cracker. 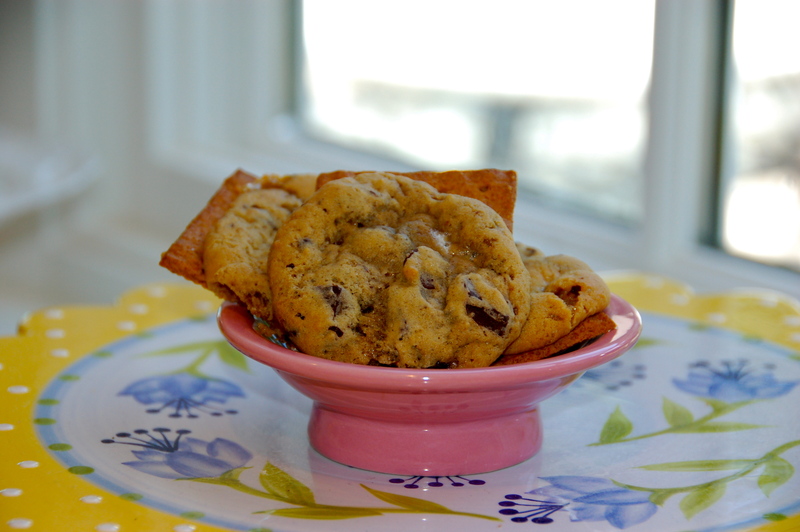 After whipping up the cookie dough, you toss a tablespoon or so on a bit of graham cracker and pop ’em in the oven. When you take them out 12 minutes later, the cookie will have spread to cover the cracker, creating a marshmallow-y, gooey, chocolate-y treat! Just make sure you don’t put too much cookie dough on the graham cracker, or the marshmallow will overflow and stick to your cookie sheet. If you’re looking for something to bring to a party (especially last minute), these cookies are always a crowd-pleaser. In fact, so many people have asked me for the recipe, that I finally decided to make a batch and blog them today! 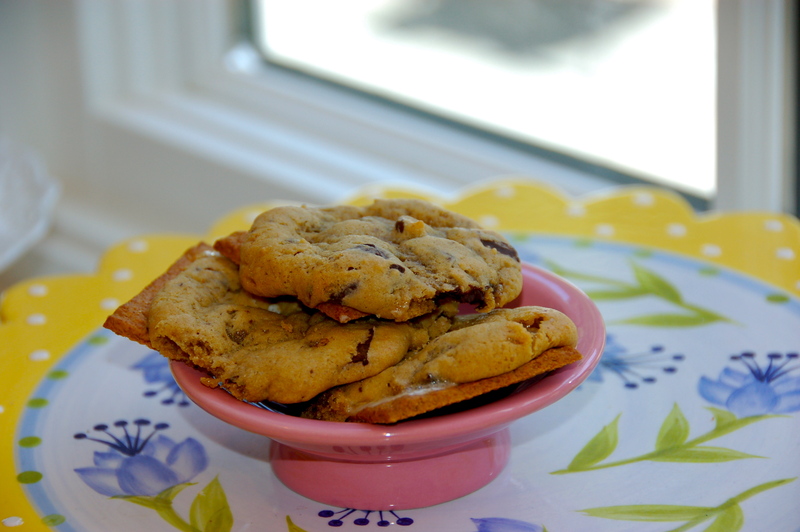 Also, these cookies are truly dangerous – you can’t have just one! If it’s a little too hot out to crank up the fire pit, (as it has been recently in CT, where I live) these cookies are the best alternative to a classic s’more. 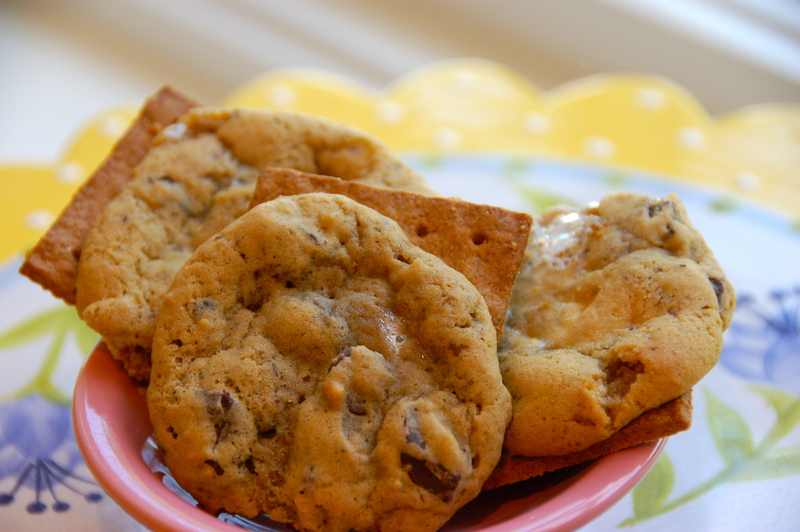 They’re the perfect summertime cookie to bake with friends, because who doesn’t love a s’more?! So, turn off the fire pit, turn on the oven, and whip up a batch of these Gooey Campfire S’more Cookies – it may be the best decision of your summer! Preheat the oven to 350*F and place 30 graham cracker halves on two cookie sheets, each about 2 inches apart. Cream together the butter and sugar in the bowl of a stand mixer, until light and fluffy. With the mixer on low, add in the eggs, one at a time, and the vanilla, beating until incorporated. Scrape down the sides of the bowl. With the mixer still on low speed, slowly add in the flour, salt, and baking soda, mixing until completely incorporated, and there are no streaks of white in the batter. Make sure to scrape down the sides as you’re going along. Add the chocolate chips by pouring them in the bowl and setting the mixer on medium speed for about 5 seconds. Do the same with the mini marshmallows, or until incorporated, but try not to break up the marshmallows too much. Place about 1 not rounded tablespoon of dough on each graham cracker, and bake for 12 minutes. The cookies may not appear completely done, but they are – they’ll further solidify once they’re out of the oven. Wait for them to cool a bit for about 10 minutes on the cookie sheet, and enjoy! These cookies are great – I know first hand. And Juliet’s right – there’s no way to have just 1!! There are some more upstairs!! Haha so glad you like them! Oh god I love these cookies already! They looks so good! Thanks Sarah!! Let me know how they go!